Would things sound different on Mars? I have a question about Mars: I know the atmosphere is a lot thinner than here on Earth so does that mean sound would travel slower there? I was thinking about Curiosity wanting to talk with one of his rover buddies & how they could communicate over long distances. Thanks guys, love the show, keep up the good work! Hannah - Is it true that on Mars, no one can hear you scream? First up, we crack into some calculations. In general, the speed of sound is proportional to the square root to the substance's stiffness divided by its density. Since Mars's atmosphere has a lower density than here on Earth, you'd expect the speed of sound to be faster than here on Earth. But if you reduce the pressure of a gas, the stiffness also reduces. 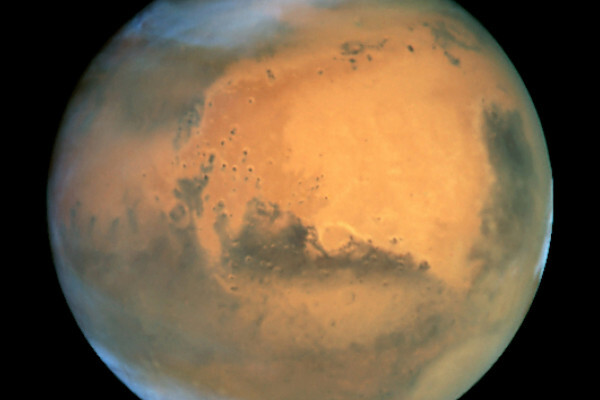 So, the speed of sound should stay about the same on Mars as it is on Earth. But there's another factor to consider. Mars is further away from the sun. How does this affect the speed of sound? Over to an expert. Catharine - My name is Catharine Conley and I'm the NASA Planetary Protection Officer. The difference is temperature. If you reduce the temperature of the atmosphere, the speed of sound does get slower. In fact, the speed of sound on Mars is about 2/3 of the speed of sound on Earth. Hannah - So, say two humans were to land on Mars, given the slightly lower speed of sound there, could they still speak to each other? A listener got in touch with his thoughts. Evan - Hello. This is Evan Stanbury from Sydney, Australia. The speed of sound on Mars is around 240 meters a second. A bit lower than the 340 meters a second on Earth. By itself, that wouldn't make sound communication harder. However, the atmospheric density of Mars is less than 1% of Earth, almost a vacuum by our standards. This means that sound attenuation is much greater and so, speech wouldn't carry very far. Human mouths and ears would not be able to couple sound efficiently into or out of the thin Martian atmosphere, so humans would be effectively deaf. Hannah - So, yes. The speed of sound is slower on Mars. Largely, due to the cold temperature there. And the atmosphere's lower density isn't suited to human speech and hearing systems which have evolved for life on Earth. Instead, radio waves, a form of light travels fine through low densities and so, can be used as a method of communication up there which is how exploratory rovers on Mars like Curiosity, communicate, not with each other but with us on Earth using radio wave messages traveling at the speed of light and taking about 15 minutes to be received here on Earth. Previous Can we image subatomic particles? Next How did our ancestors make wine? Why do I get radio fatigue?